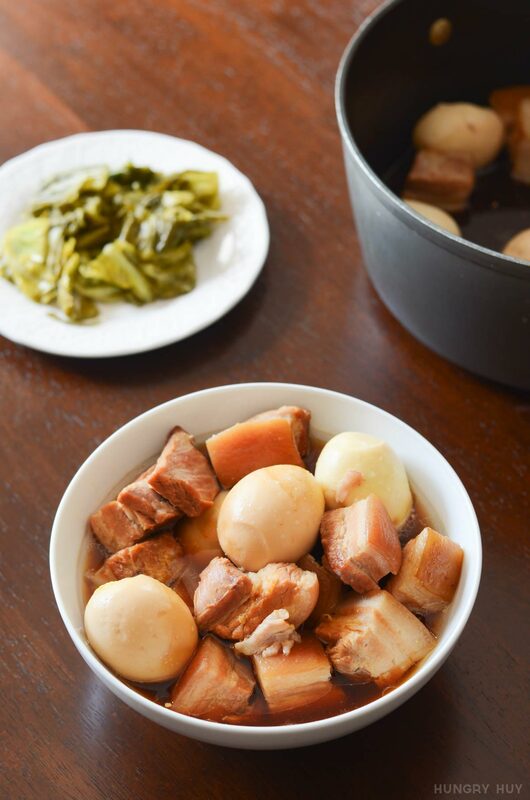 This thịt kho recipe is a low and slow braise so the meat is going to be reeeeally tender. In this recipe we’re going to use pork belly because the fat on it makes this taste much better. If you can get pork belly with the bones, you’ll have even better results, but you can also substitute for whatever cut you prefer especially if you like it leaner. My ideal ratio of pork for this dish is actually 3/4 pork belly and 1/4 of a leaner cut like shoulder. 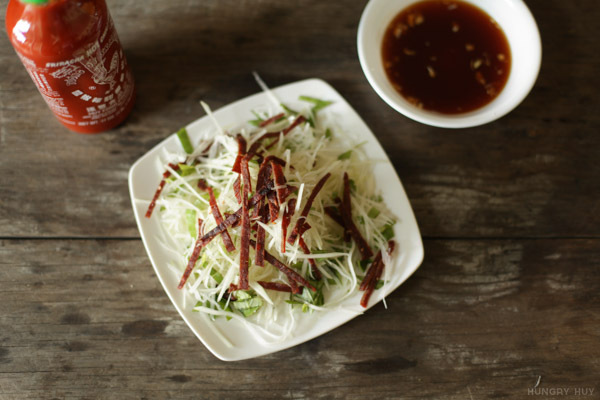 This dish is seen in very slightly modded variations across other ethnic cuisines, not just Vietnamese. I’ve seen variations in Japanese food, Chinese food, Filipino and Taiwanese food too. I don’t know the actual connection–why all these Asian cuisines have this. Perhaps is the readily available and common ingredients for a simple recipe. It keeps well, and is delicious too. Near me in Southern California’s Little Saigon, I hear you can get a higher quality of pork belly at Quang Minh Mini Market. It costs more for the belly, but there seems to be a consensus that its worth the cost–something I need to check out! 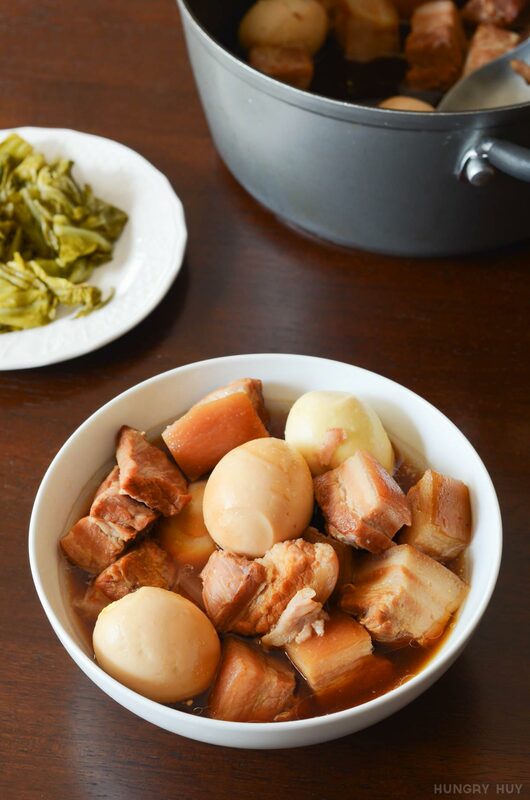 However, I’m having excellent thit kho results from using nearby Vietnamese and Filipino supermarkets in the meantime. Here are the brands I use for the seasoning: Rico coconut soda, Kikkoman soy sauce, and Three Crabs Brand fish sauce. The thick soy sauce brand is Koon Chun, to be used in a pinch for color, but you really should be making your own simple caramel coloring (nuoc mau). As a kid I enjoyed separating parts of this dish, mashing the yolk with the rice and spooning sauce over it. My cousins were always requesting grandma to make this dish, and even as they grew older. They’d request this dish with “extra sauce” for y’all salt fiends. It is an easy and effective way to stretch the dish with more rice too. 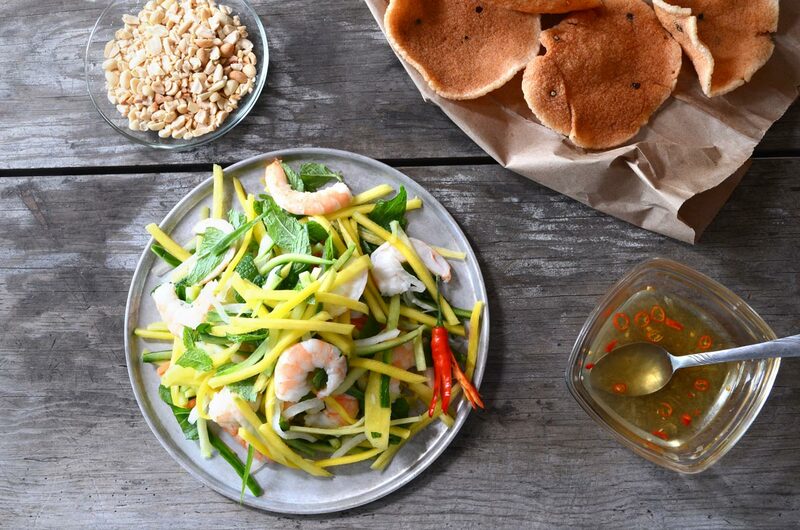 This dish is commonly eaten with a side of dua chua (pickled mustard greens) which provides a fresh and crunchy balance. Any kind of salty meat like this pairs well with a pungent, vinegary pickle. I have tried adding slices of yellow onion too and it adds a nice layer of flavor to this dish. 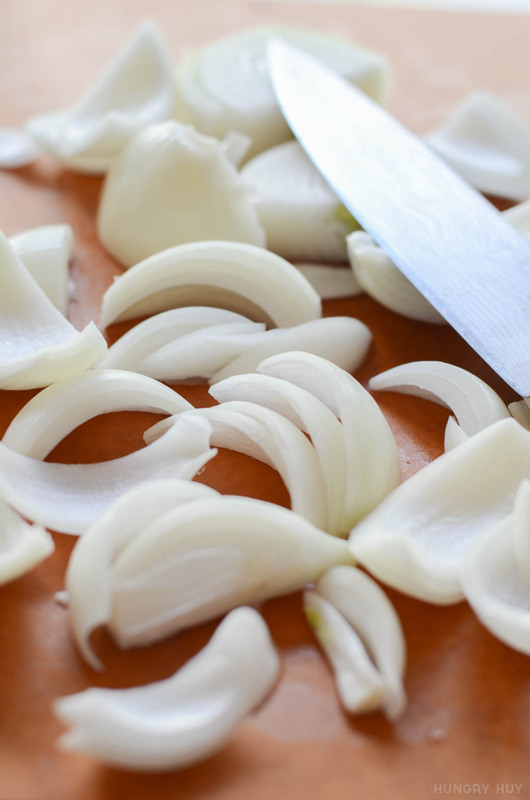 You can remove the onion at the end of the braise if you prefer since it will have given up all its flavor to the broth. 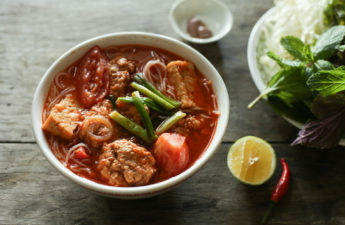 For the seasoning in this thịt kho recipe: tinker with the soy sauce, fish sauce, and salt after the liquid has finished reducing, to taste. This dish scales very well too if you want to make larger quantities for the family. I love the eggs with this, personally, at almost a 1:1 ratio so it’s hard to have too many. 4 tablespoons sugar for the caramel color (nuoc mau). This is to deepen the color of the dish. Depending on how dark your caramel sauce gets, you may not need to use all of it. In a pinch, you can use about ⅕ teaspoon of thick soy sauce instead, but the caramel sauce will tastes better. Cut the pork into smaller pieces. I like 1.5" cubes so it cooks slightly faster. Bring 2-3 quarts of water boiling on high, or enough to fully submerge the pork.When the water's boiling, add the pork for 1-2 minutes just to clean it. Drain then rinse the pork under running water until the water is clear. Add the coconut soda, soy sauce, fish sauce and salt to the pot. Fill up the pot until the water just covers the pork. Turn the heat to high. When it hits a boil, drop the heat until you still see a slight boil, maybe about about 25% heat and let it simmer uncovered for about 1.5 to 2 hours. Check and stir the pot every 20 minutes. The longer you cook it, the softer the pork gets. Leaving it slightly uncovered lets the liquid reduce so you get a nice concentrated sauce later. Make the caramel color and add it to the pot. 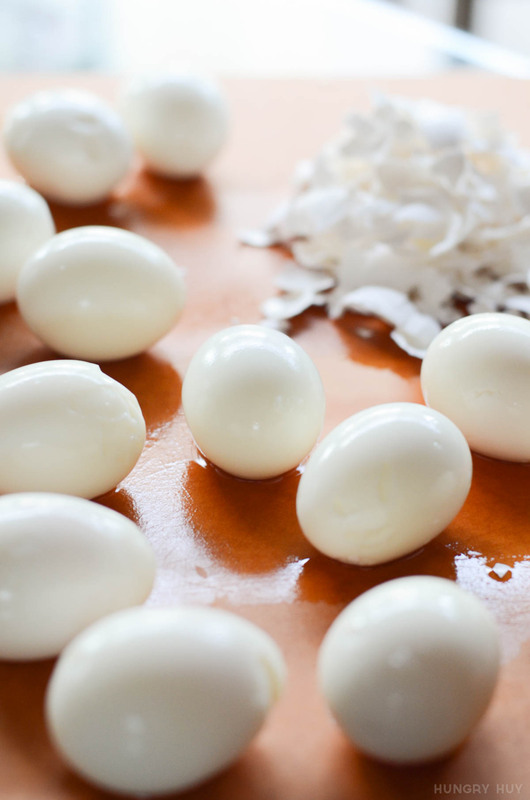 Make the hard-boiled eggs: add to a pot and cover the eggs with cold water by 1 inch. Bring to a boil on medium-high heat. Remove from heat and let it sit for 8 minutes. Cool in water then peel. Add the hard boiled eggs to the pot of pork in the last ~30-40 minutes of cooking. Add the onions at this time too. When there are about 30 minutes left on the timer, add the eggs. Eventually we want the liquid to reduce to about ⅓ or ¼ of the original. 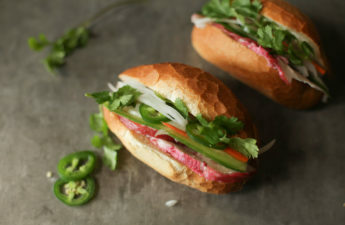 its so hard to find vietnamese recipes i understand and use online. more more more. This reminds me of a Korean side dish called “Jang Joh Rim.” I wonder if they taste similar! Yeah it seems a lot of Asians share a similar variation of this dish! Huy, do i cover the pot with a lid? or leave it open? You only need to cover it slightly at the start so the liquid can reduce. Towards the end you can probably remove the lid entirely–adjust as needed. Really great recipe, the step by step pictures are really appreciated. Thank you for sharing, and keep them coming! Similar to adobo in the philippines:) ill try this recipe..
A friend made this as a comfort meal for me once and I loved it! Lid open mostly, to reduce. If the meat is still tough you can add water as needed and continue to boil uncovered until it reaches a sauce thickness you like. This is way better than the Filipinos’ adobo. 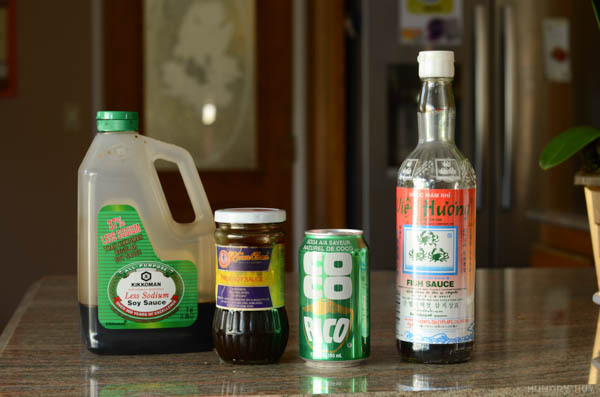 make sure you use good fish sauce, like the one pictured above. I love the pictures and the steps are very similar to my notes from my mom’s cooking lesson to me. The only thing is I just cooked it today with the country style boneless ribs and I compared it to the pork belly meat. Somehow the rib meat was more tough. Is there a way to make it more tender? I cooked 2hrs as your recipe dictates. Also, many people asked & I wonder also, do you cook your pot covered or uncovered? I cook it uncovered so the liquid can reduce (evaporate) to an amount I like. If you see it reduces too much you can put the lid back on or add some water. 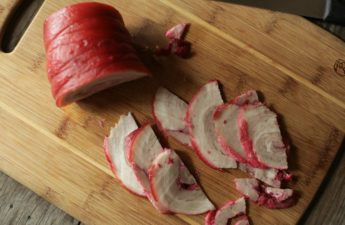 As for toughness of the meat, different cuts will vary in amount of connective tissue. Just cook it longer if its still too tough. At first I was afraid to overcook it, but giving it more time has always resulted in tender results. Just check it every 15 minutes or so. Is that a typo? This doesn’t take 20 hours does it? If so, can we cook this in a crock pot? By the way, I’ve had this dish many times at parties and IT IS TO DIE FOR! I love that the ingredients are simple and so are the directions. Is there a substitute for the coconut soda, if I’m not able to find it? Thanks! I’m DYING, that’s hilarious!! Yeah I meant to say 2 hours–oops, that’s been updated and thanks! The best thing you can use is fresh coconut juice, coco soda 2nd, then 3rd is cola or lemon-lime soda. Hope that helps. Have you or can you substitute chicken or beef. I have taken pork out of my diet. Hey Trinity, I personally haven’t tried it but I bet it would be pretty good too. I’ve had this with tofu instead of meat and really enjoy that version too! Super easy recipe to follow, and ended up delicious! I used pork shoulder only because the local grocery store didn’t have any pork belly left, and the end product was still absolutely delicious! The meat was so tender and flavorful without being too salty. Thanks for sharing this recipe! Hi everyone, I always use a clay pot to make this dish and it comes out delish! 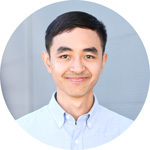 Thanks for the recipe Huy! Hi, I made this and it was wonderful. I noticed that you didn’t tell us when to add the onions to the broth. I added the onions at the same time as the boiled eggs and it was great. Thank you for sharing your recipe! Yep this timing works–I’ve updated the recipe! You can add it later if you want crunchier onions. Thanks for sharing, and reading my blog, Christine! Thanks–but the recipe doesn’t state where to add the onions? 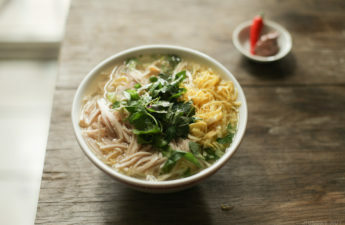 Sorry about that–you can add it when season the broth so it adds flavor at the same time. Thank you for this easy to follow recipe. My sister and I LOVE this dish growing up but and unfortunately didn’t learn how to make this. Over Christmas I made this for our kids and like us they LOVED it. should I brown the pork belly first? Usually in the past when I’ve used this recipe I’ve just done it with pork shoulder or something similar. However this time I’m doing it with the Pork Belly and I was just wondering if you leave the skin or take it off?